According to The BioInitiative Group there is body of evidence to suggest that: “if exposures are prolonged or chronic that they could result in adverse health effects and interfere with normal body processes (disrupt homeostasis), prevent the body from healing damaged DNA, produce immune system imbalances, metabolic disruption and lower resilience to disease across multiple pathways. Essential body processes can eventually be disabled by incessant external stresses (from system-wide electrophysiological interference) and lead to pervasive impairment of metabolic and reproductive functions “. 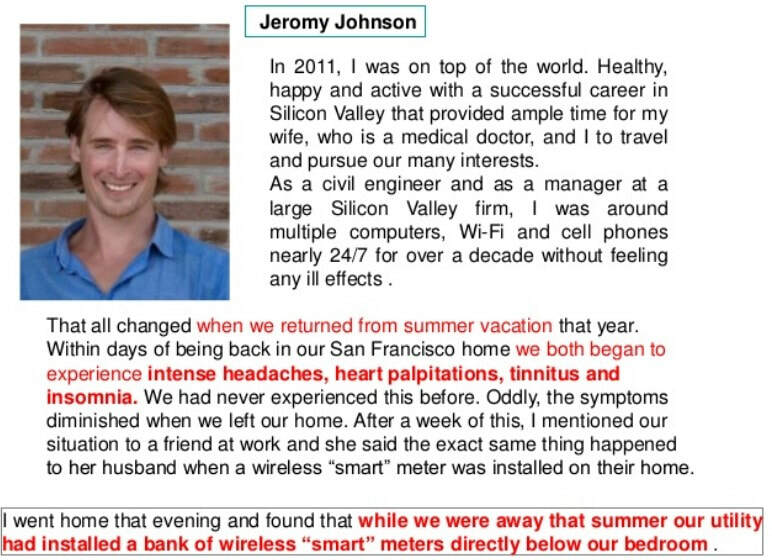 The worldwide and rapid growing EHS or Electro Hypersensitivity condition is according to Dr Mallery-Blythe a “cumulative exposure-triggered condition” and is characterized by an awareness of/adverse response to even extremely weak electromagnetic fields (far below current safety levels) of varying frequencies, intensities and waveforms” . “The number of people with EHS symptoms is likely to be far higher than the estimated 4–10% of the population reported by several countries. Given the ubiquity of exposure in all environments, it can be difficult for people to notice the association” . With enough exposure, given the exponential increase in the past decade of the use of wireless devices including Wi-Fi and smartphones, and increase in the levels of radiation in the environment from the wireless infrastructure, it is possible that EHS could manifest in all members of the population. Many children are also affected but undiagnosed and they are more likely to develop EHS since they are exposed from a young age, their systems are developing, and their bodies are quicker to absorb [18,24]. “If EHS is unmanaged and there is general deterioration, there will be reaction to an increasingly broad range of frequencies at increasingly low intensities. The number of electromagnetic devices triggering the symptoms will increase, symptomatic distances will decrease and irreversibility will become more likely” . Tingling in hands and pain and a feeling of heat in the head when using a mobile phone. People may experience different symptoms from different radiation sources and depending on the radiation source the symptoms may change from one day to another. One person’s reaction to an EMF source might differ from another person’s reaction [20,21,22,23,24,25]. “While other conditions have been associated with exposure to radiation from wireless technology, such as brain & breast cancer, fertility problems, autism and ADD, it seems that the most widespread manifestation of harm from this technology is EHS” . Nervous system disruption, which sends the body into a perpetual fight-or-flight response prevent it from resting, repairing, healing and regenerating normally. Oxidative stress and chronic inflammation which affect all the body’s organs. Dr Mallery-Blythe is a Trustee of the EM Radiation Research Trust, Board member of Cellular phone taskforce (CTPF), Medical Advisor ES-UK and has also founded a medical doctors’ organisation called PHIRE (Physicians’ Health Initiative for Radiation and Environment) which is an independent association of medical doctors and associated specialists assembled for the purposes of improving education regarding health effects of non-ionising radiation . ​Body Electric: Electrosmog to Electroceuticals . 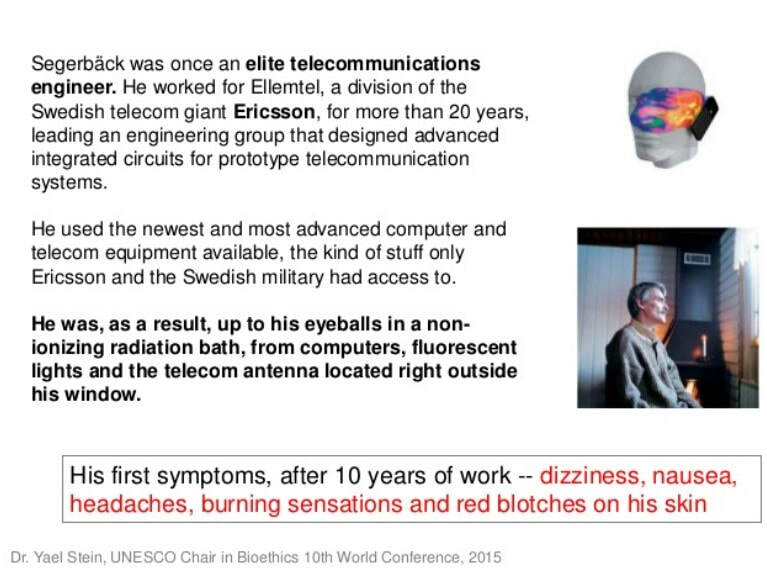 "This is a video clip for the upcoming documentary film Body Electric, which will investigate the electric nature of the human body, the risks associated with EMFs and future therapeutic applications based on a greater understanding of how EMFs affect the human body". “Physiological research shows that the symptoms experienced by people with ES are an indication of severe physiological injuries. Prof. Dominique Belpomme’s research which was published in 2015, examined 673 people with ES. The research found severe injuries including breakage of the Blood Brain Barrier, damage to the limbic system and the thalamus, oxidative stress, autoimmune damage and neurodegeneration (Belpomme et al 2015). Prof. Belpomme’s research started in 2008, and although the findings were not yet published, the data from the research was quoted by the Council of Europe in its 2011 opinion paper on wireless harms “The potential dangers of electromagnetic fields and their effect on the environment” as support to its determination that ES is a physiological condition of intolerance to electromagnetic fields and radiation (section 8.1.4)” . “Many other published peer-reviewed studies found severe physiological injuries from radiation in people with ES including heart irregularities, damage to the autonomous nervous system regulation when exposed to RF (Wilén et al, 2006); effects on the heart rate, heart rate spectrum ratio spectrum, electrodermal activity and changes in alpha and theta spectral bands of EEG when exposed to magnetic fields (Lyskov et al 2001); reduced intracortical facilitation (Landgrebe et al, 2007) ; thyroid dysfunction, liver dysfunction and chronic inflammatory processes (Dahmen et al, 2009); changes in (1) heart rate variability (2) microcirculation (capillary blood flow) which is analyzing the capacity of autonomous nervous activity (3) electric skin potentials (Tuengler et al 2013)” . ​“Live blood cells become sticky and clump together (rouleaux formation) when I use a computer or a mobile phone. This type of analysis may be useful for diagnosing people with electrohypersensitivity” . Live Blood & Electrosmog . Unfortunately, most doctors are not familiar with and can therefore not diagnose/treat EHS – Dr Mallery-Blythe has established the organization Physicians’ Health Initiative for Radiation and Environment (PHIRE) http://phiremedical.org/join-phire/ to inform doctors and the public. 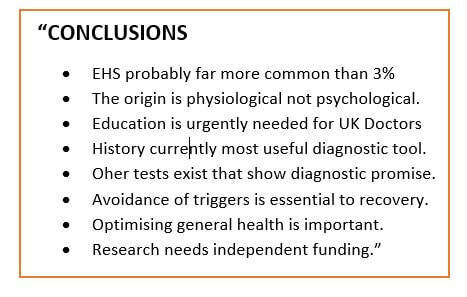 In Dr Mallery-Blythe’s conclusion of her talk, she states that “avoidance of triggers is essential to recovery” . “The primary method of treatment should mainly focus on the prevention or reduction of EMF exposure that is reducing or eliminating all sources of EMF at home and in the workplace. The reduction should also be extended to schools, hospitals, public transport, public places like libraries etc. in order to enable EHS persons an unhindered use (accessibility measure). Many examples have shown that such measures can prove effective. Beside EMF reduction, other measures can and must be considered. These include a balanced homeostasis in order to increase the “resistance” to EMF – measures that enhance the immune system and reduce stress in combination with detoxification will promote EHS recovery”. Please see page 22 -26 - EUROPEAM EMF Guideline 2016 for further details . ​Also NOTE the following additional recommendation by http://www.weepinitiative.org/livingwithEHS.html . ​ Source: Living with EHS: A Survival Guide . 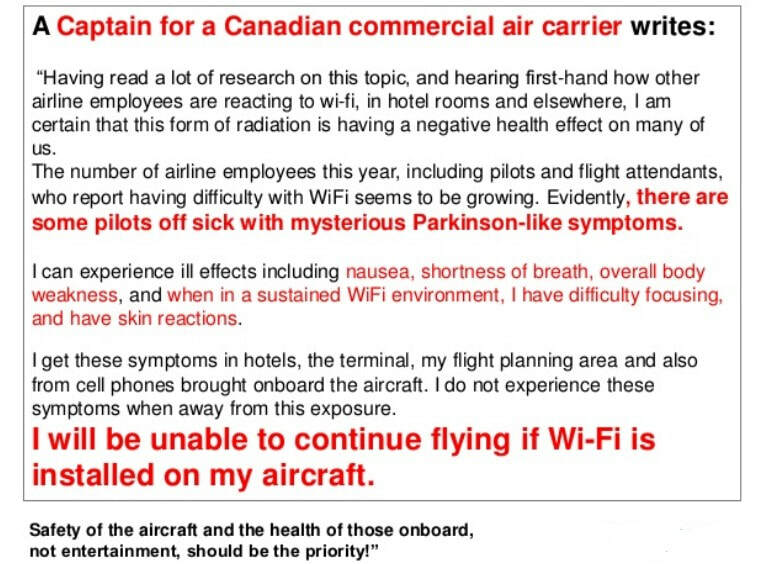 “For Electromagnetic hypersensitivity (EHS): use the existing diagnostic codes for the different symptoms plus code R68.8 “other specified general symptoms and signs” PLUS code Z58.4 “Exposure to radiation” and/or Z57.1 “Occupational exposure to radiation”. For EMF-related health problems use the existing diagnostic codes for the different symptoms PLUS code Z58.4 “Exposure to radiation” and/or Z57.1 “Occupational exposure to radiation” . 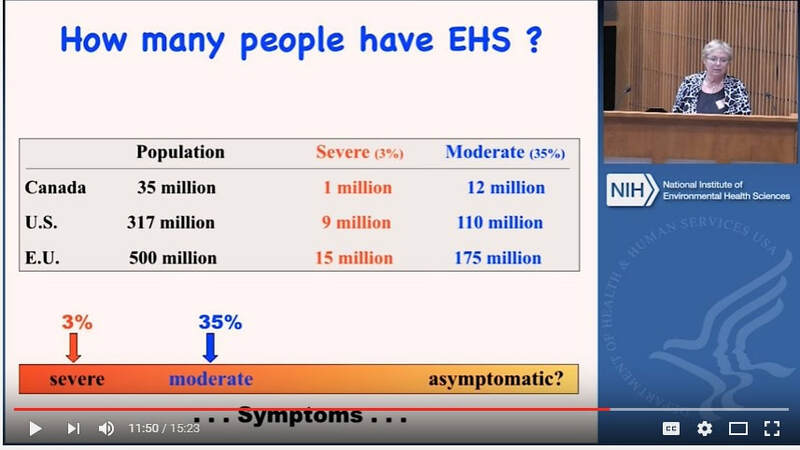 Diagnostic codes are also mentioned by oncologist and Professor Lennart Hardell in his talk about EHS (Electrohypersensitivity)/MCS (Multiple Chemical Sensitivity) at the Paris Appeal Conference 2015. “EHS is already affecting a very large number of people, many of whom are unable to work due to their condition, resulting in lost revenue. An extra burden is placed on healthcare agency resources due to inappropriate diagnosis and management of common symptoms. 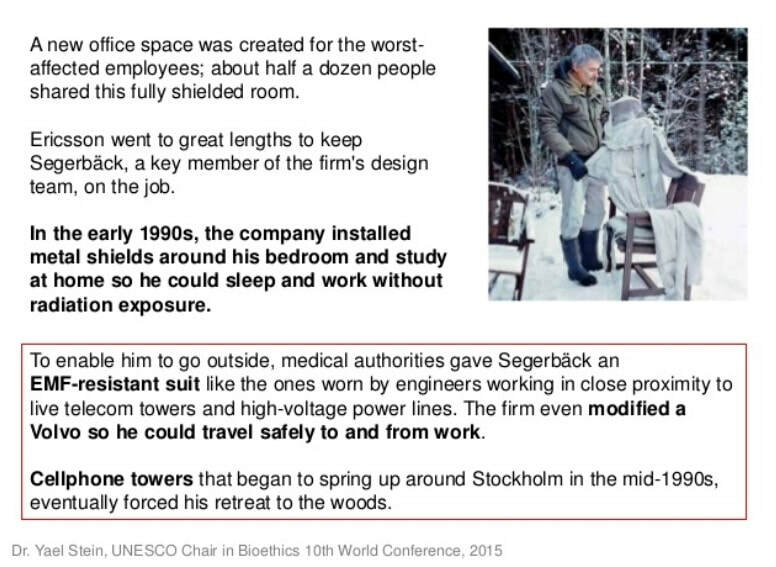 In more severe cases, individuals are forced to live in extreme isolation to avoid radiation which brings with it poverty and poor health, with some living in cars and tents, which can also prove threatening to health and life, especially in extreme temperatures. They cannot access basic, life-sustaining public amenities, such as grocery stores and healthcare facilities, which constitutes a clear breach of their human rights” . 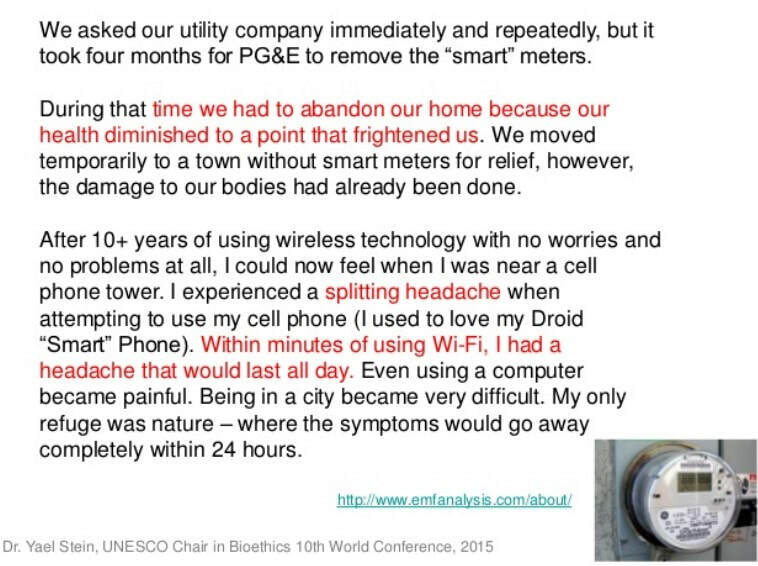 An EMF refugee is one of the many millions of people in the world who are looking for places to stay, free of man-made microwave radiation and electrical pollution. They have been sensitized to the commodity that our entire modern world is based on - the microwave radiation that drives our wireless digital technology and the world economy. Throughout our developed and civilized world there are people from all walks of life: accountants, doctors, lawyers, teachers, computer programmers, cashiers, clerks, technicians, electricians, CEOs and schoolchildren who are seeking natural areas, farms, remote communities, caves, remote beaches, secluded valleys, and radio-free white zones, where they can live without the pain of EHS. Often they have had to abandon their careers, homes, school, community and family in order to find a safer place to live. A person who was once active with email, Facebook, Twitter, blogs or regular mobile calls may need to drop all electronic communications. Most people will think that their Facebook friend has become distant and unresponsive, while in fact they are trying to preserve their health, survive and not get worse. While some EMF refugees recover others spend the rest of their lives outside the community. "Where can we live?" . Teaser for the documentary "Where can we live? - about being electrohypersensitive". For three years we followed two Swedish young women affected by EHS. They both have families with young children. Lisa has left town and her studies in economics in order to concentrate on getting stronger and healthier. Linn is a computer engineer and she eventually moves away from the capital to a new job and a new kind of life in the countryside. We are the Evidence . WATE intends to expose the suppressed epidemic of sickness, suffering and human rights crisis created by wireless technology radiation; elevate the voice of those injured; defend and secure their rights and compel society and governments to take corrective actions and inform the public of the harm. They work through education, lobbying and legal action. 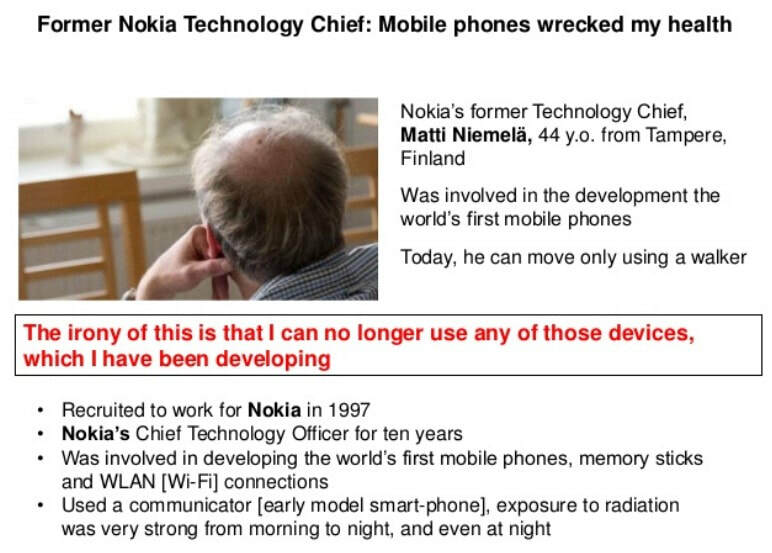 A Cell Phone Destroyed My Nervous System & Health . A project engineer suddenly gets sick from using her mobile phone, NSW, Australia. ​National Geographic- Taboo EHS High Frequency electromagnetic filed sensitive people - WiFi GSM . “Hyper Sensitives Should not be Refugees . Forcing people with such functional impairments out into various sanctuaries or zones is completely in opposition to the UN disability laws…………… realize that it’s the whole environment that must be accessibility-adapted, and do not forget that such accessibility measures actually are 100% positive for everyone to share! People with functional impairments should have full access to the entire society, not just a small part of it. The human rights for all of us, regardless of functional impairment, is that we should live an equal life in a society based on equality. It’s that simple. (I’ve never heard anyone voluntarily wanting to give up their human rights, so be sure not to have any country forcing its citizens to it; it would be extremely shameful)” . ​Jolie Jones Interviews Professor Olle Johansson about EHS / EMF effects . ​The following guide provides potential areas around the world that may be suitable for those looking for radiant free EMF asylum areas also called WHITE ZONES.